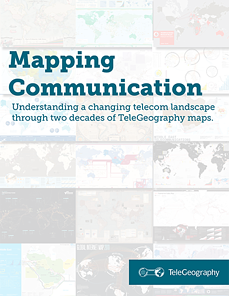 Our new e-book Mapping Communication looks at nearly 50 TeleGeography maps from the last two decades while tracking the shifting telecom landscape documented from one edition to the next. To create this resource, TeleGeography mapmakers revisited their favorite and most famous pieces, sharing behind-the-scenes stories about how these maps were designed and printed. Our team also scoured blog posts, press releases, and emails from the release of each map to understand the telecom story living in each edition. "All [TG maps] were representations of the spaces in between, the strands of connection that we typically ignore. The countries and continents were afterthoughts; their action was in the emptiness of the oceans. Yet these maps were also representations of physical things." 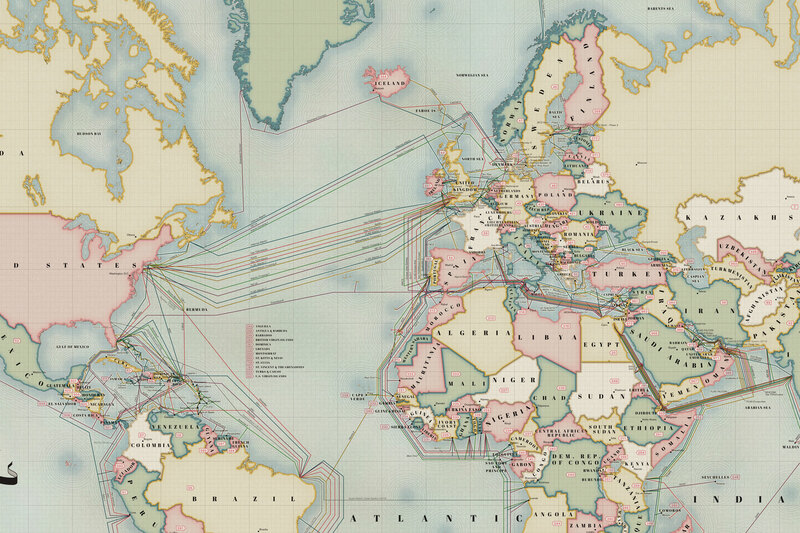 For example, way back in 1997, the second-ever TeleGeography map clearly hinted at the explosion of new fiberoptic cables that was to come. The 2010 Global Voice Traffic Map came on the heels of new data showing that the growth of international telephone traffic was slowing, while Skype’s growth was accelerating. And our Africa Telecom Map visualized huge changes to the continent. Before 2009, only 16 African countries were connected to a submarine cable system. By 2017, 26 cable systems had been deployed to connect the region. You can find these stories and more in Mapping Communication, which is free to download here.